Featuring an indoor heated lap pool, a hot tub, sauna and fitness center, Meriton Serviced Apartments - Campbell Street is across from the famous Capitol Theatre. The 40-level apartment complex is in the Haymarket district, on the doorstep of Chinatown. Paddy's Markets, Sydney Entertainment Centre and Central Station are all within a 5 minute walk of the property. The air-conditioned apartments feature cooking and laundry facilities. Each apartment has a flat-screen TV with cable channels and a DVD player. Guests have the added convenience of many nearby restaurants and cafes. A selection of local restaurants offer meal delivery directly to your apartment. 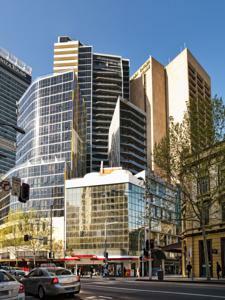 Rooms: Apartments: 247, Hotel Chain: Meriton Serviced Apartments.